Salesforce is stepping up its internet of things (IoT) game, launching a low-code service to help enterprises get started using IoT to improve customer relationships, writes Enterprise Cloud News (Banking Technology‘s sister publication). Salesforce.com Inc. IoT Explorer Edition builds on the company’s IoT platform, launched two years ago. The company says is looking to use IoT to help enterprises connect “with the customer behind every device, sensor and application”. “Most of our customers have been talking about IoT for years, but the majority of customers don’t know what to do with it,” Bo Mangels, senior manager of product marketing for Salesforce IoT, tells Enterprise Cloud News. “They’re looking for a way to experiment and work with that data and connect it back to their own systems.” And IoT Explorer Edition provides that means, Mangels says. It captures connected device, sensor and application data, ingests the data to the Salesforce platform for analysis and integration with customer data, and uses rules to trigger sales, service and marketing campaigns. For example, administrators at a solar supply company can build automated workflows that trigger service calls whenever a wind turbine generates energy below certain levels. And IoT Explorer Edition puts data in customer context – for example, whether a customer’s devices are seeing frequent failures, or if equipment is approaching end-of-life and therefore provides a sales opportunity, Salesforce says. Pilot customers include Emerson, which provides climate solutions, and is using Salesforce IoT to deliver service on heating and air conditioning units based on real-time diagnostics. Schneider Electric is driving targeted sales campaigns that anticipate a customer’s next purchase based on the performance capacity of existing electric equipment. And Lippert Components, which makes RV parts, is using IoT Explorer to track components that might be functioning improperly and proactively get them repaired, establishing a direct connection with customers. 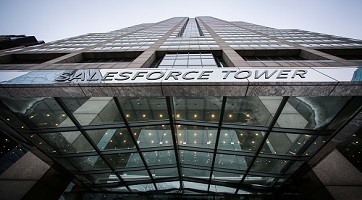 By appealing to the customer relationship, Salesforce is bypassing IT and instead selling IoT to sales and marketing, Christian Renaud, research director of IoT for 451 Research, tells Enterprise Cloud News. And because Salesforce is delivering business outcomes, it’s bypassing competition with other technology vendors and instead competing with business process services such as Accenture, Wipro, Deloitte and Tata, Renaud says. Taking full advantage of IoT requires completely reinventing a company’s business strategy; Explorer Edition is a good first step. “Customers need an intermediate stepping point,” Renaud says. “You’re not going to convert your whole organisation at once – not going to name the kids on the first date.” Using IoT Explorer Edition, enterprises can do a pilot project, get a quick win, and move on to bigger things. Will offer Trusona’s password-less login solution to its enterprise customers across the nation. Salesforce has upped its efforts in the artificial intelligence (AI) world, introducing three new features for developers in its continued quest to "democratise" the technology. Softbank has upped its investment in security firm Cybereason, as the focus on artificial intelligence (AI) continues. How do you try and become one of the biggest and most influential technology companies in the world? Just move the $15 billion you have stashed away into the R&D business.